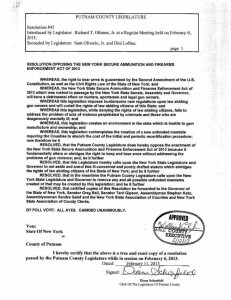 Putnam County resolution opposing NY SAFE act. Download Putnam County Resolution #45 of 2013 and related Putnam County Resolution #46 of 2013. Passed unanimously on February 6th. Introduced by Legislator: Richard T. Othmer, Jr. at a Regular Meeting held on February 6, 2013. Seconded by Legislators: Sam Oliverio, Jr. and Dini LoBue. 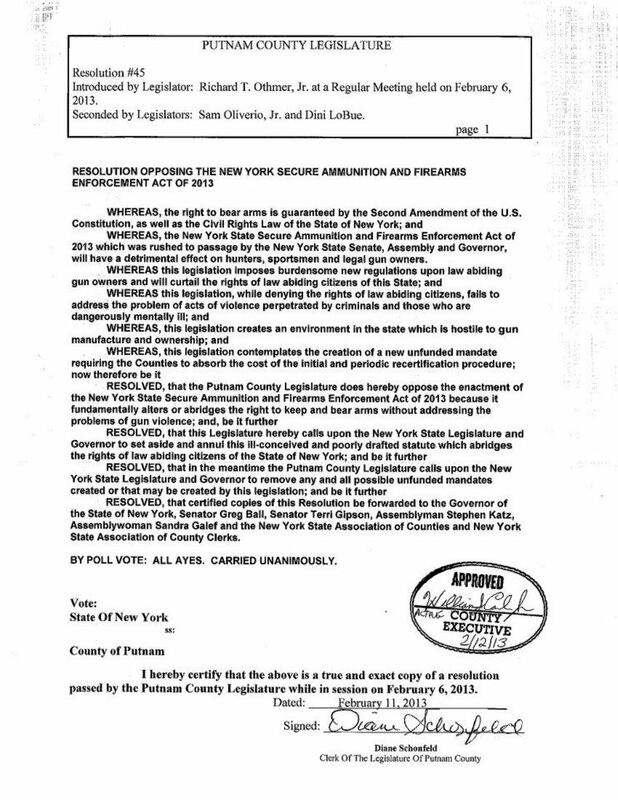 RESOLVED, that certified copies ot thls Resolution be forwarded to the Governor of the State of New York, Senator Greg Ball, Senator Terri Gipson, Assemblyman Stephen Katz, Assemblywoman Sandra Galef and the New York State Association of Counties and New York State Association of County Clerks. BY POLL VOTE: ALL AYES. CARRIED UNANIMOUSLY.